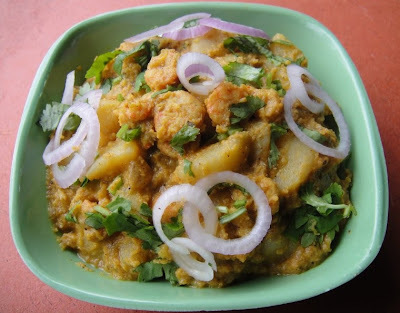 This Potato Shrimp Masala I cooked during my recent stay in Mumbai. My kitchen was not well equipped, few times I managed to cook with available ingredients. I had one cup cleaned small shrimps and two potatoes, few spices which I had brought to enrich my spice rack in USA. I decided to add few unique spices - Tirphal, Dagad phool and Nagkesar and addition of some finely ground coconut paste influenced this curry with Malvan/Goan style flavor and aroma. 1 cup small size shrimps cleaned and deveined - Marinate with salt and turmeric. 2 medium size potatoes diced in 1/2- inch cubes. (3 cups full). 1 medium size onion - finely chopped. 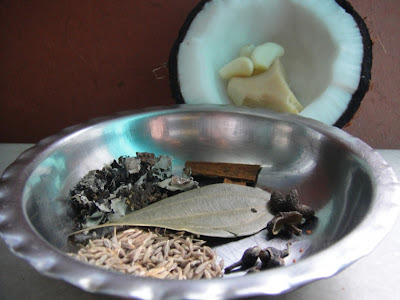 1 cup fresh grated coconut - Grind to fine paste by adding 1 cup water. 1 inch piece ginger - finely minced. 3-4 cloves of garlic - finely minced. Slightly toast all the above spices and make fine powder. Take medium size heavy bottom pan and heat 1 Tb.spoon oil. Maintain medium heat. Add finely chopped onions. Saute them till they turn soft. Add finely minced ginger and garlic - Mix and saute with onions for about 1 minute. Mix finely ground powder of spice blend and stir-fry for one minute. Add 6-7 shrimps and saute for a minute. Add all cubed potatoes, little salt, 1 T.spoon red chili powder. Mix all well and stir-fry for two minutes on high heat. Add 1 Cup water and reduce flames to medium and let it cook for 6-7 minutes with closed lid. Stir at regular intervals. Add half ground paste of coconut and marinated shrimps. Mix all together. Add little chopped cilantro and let it cook on medium flame with closed lid for 7-8 minutes. Adjust final salt level. Stir at regular intervals. Add remaining ground coconut paste and adjust thickness of gravy as per your taste. Check if potatoes are rightly cooked. Let it cook for another 3-4 minutes without lid. Add remaining chopped cilantro and serve with rice and roti. In absence of those unique spices you may use 1 Tb.spoon ready made Garam Masala, it will still bring flavorful taste to this curry. Remove seed from Tirphal spice and pound it very hard before grinding into powder. You may avoid grinding but in that case use 6-7 whole Tirphal. If you have bigger size shrimp then use 15-20. I used very small shrimps which were 30-40 in count.